This is a very impressive, delicious dish — if you like salmon, that is — that takes very little effort. I was especially in love with the look and texture of the crust; it’s a gorgeous deep-gold color and lends the fish an appealing crunch. I served this along with piselli con asparagi e basilico . Note: be sure to finish the sauce with a pat of butter, or risk an overly acidic sauce. Heat 1 tablespoon oil in a 12-inch nonstick skillet over medium heat. Pat salmon dry and sprinkle with 1 teaspoon salt and 1/2 teaspoon pepper. 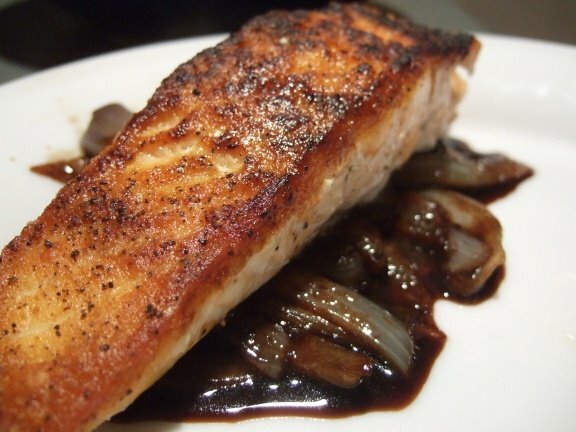 Place salmon skin side up into the hot pan and cook until undersides form a golden crust, about 12 to 15 minutes. Turn fish over and cook until just cooked through, about 3 minutes more. Meanwhile, heat remaining 2 tablespoons oil in a separate skillet over medium-high heat until it shimmers. Sauté onions until golden brown and crisp-tender, 6 to 8 minutes. Stir in vinegar, sugar, and 1/2 teaspoon salt and cook until sauce is syrupy, about 2 minutes. Remove from heat and stir in butter. Spoon onions with sauce onto plates and top with salmon, skin side down.